At Ramkey Communications Inc., Safety isn't just a part of our day-to-day tasks, it's our most important value. From our infield technicians to our CEO, it is the responsibility of everyone at Ramkey Communications Inc. to ensure each worker, including direct employees and subcontractors, arrives home safely to their families each and every day. Accidents don't just happen; they are caused by neglect and failure to control hazards. Ramkey Communications Inc. Health & Safety program is based on established safety techniques. Developed in-house, the program meets OHSAS standards and complies with all jurisdictions, in many cases exceeding local requirements. Auditing is conducted annually by an in-house Auditor, results and findings are given to the Infrastructure Health and Safety Association (IHSA) for review. 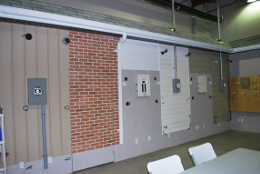 Our onsite training facility is a classroom surrounded by residential and commercial facades. It includes a CSEs, pedestals, panels, aerial drop distribution and fibre optic cable to name some of the hands-on materials for new recruits. Here our Technicians will learn the fundamentals of cable and eventually master their skills- they can even practice fishing lines and locating underground cable lines. We expanded on our cable infrastructure to include network and data lines, surveillance, security and Home Theatre systems for advanced training. Eric Smiley, Certified Ramkey Trainer, facilitates training modules on safety, service, installations, fibre optics and other network services. All courses are geared to set new employees up for success with hands-on applied learning. We will also use our training facility to keep our existing employees current on the latest in technology along with any future training needs Ramkey or our partners may have. Ramkey provides quality safety training to ensure our team is educated in safe work practices through our mandatory training programs. The list below outlines a sample of just some of the training programs we facilitate at our onsite training facility. Earlier in 2014, Ramkey partnered with Fleetmatics (SageQuest) to implement GPS units in all of our service vehicles. We currently have 130 units installed and every new vehicle automatically gets one too. Since launching this tool, we have seen improved efficiencies, productivity, "on-time" accountability and safety measures by our employees. © 2019 Ramkey Communications inc.